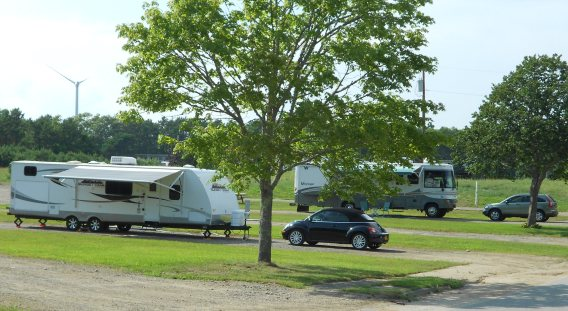 Opened in 2013, the RV Park is a very popular facility on Base Cape Cod (BCC). The 5 gravel sites off an access road are nestled within the private housing area. The park is a short drive to the central part of Base Cape Cod where you will find the CG Exchange, C Side Recreation Center, C Side Lanes, Roxy Movie Theater, and also the C Side outdoor pool. The base has easy access to both Route 28 and Route 6 making it ideal for your Cape vacation! RV Park is for recreational use only, not intended for families to use as temporary housing for PCS moves. Hard shell campers ONLY. No pop-up campers or tents allowed. SITES ARE ASSIGNED AT CHECK IN. Reservations cannot be booked more than 90 days out. The maximum length of stay at one time is 14 days with a max of 28 days in a calendar year. After the initial 14 day stay is completed, patrons can continue on a space available basis. This second reservation period can last up to 14 additional days (28 days total). If space is not available after the initial 14 day reservation is complete, a 7 day period must separate the first and second 14 day stay. Payment for the entire reservation period will be required at check-in. Refunds will not be given if changes to the reservation period are made after payment is completed, unless the situation is due to an emergency beyond the control of the patron (i.e. change to military orders, operational necessity, hospitalization and/or death in the immediate family.) In these cases, payment will be refunded with proof of the emergency.